The controversy around woody biomass energy (the burning of wood for fuel) continues to escalate around the globe. 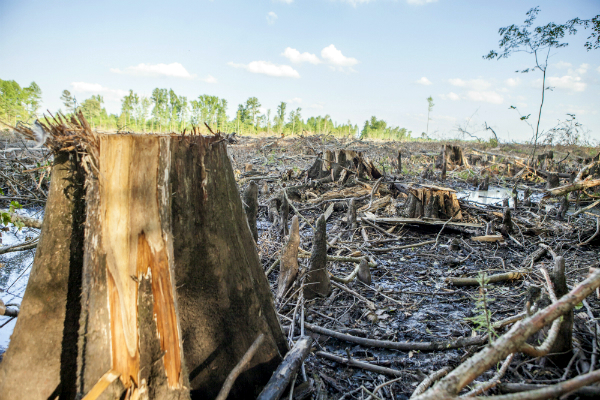 Will Europe change direction on biomass? What will the United States do? 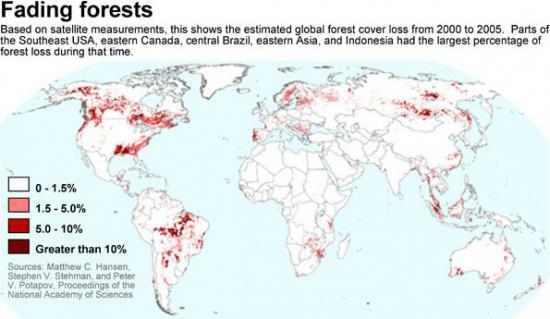 How do we measure forest carbon loss? Most of these complicated questions often come with complicated answers. But for folks who live in the South and have interacted with extractive industries on a daily basis for years, the issue is simple: this is just another set of large corporations who come to our region, into our environment and communities, extract our natural resources, making millions at the expense of hard working Southerners with no lasting benefit to those of us who call this region home. When the well goes dry, they leave behind a wake of destruction. Dogwood Alliance has been standing up for our Southern forests and communities for nearly 20 years with the clear and accurate message that burning trees for electricity is bad for our forests, communities and climate. 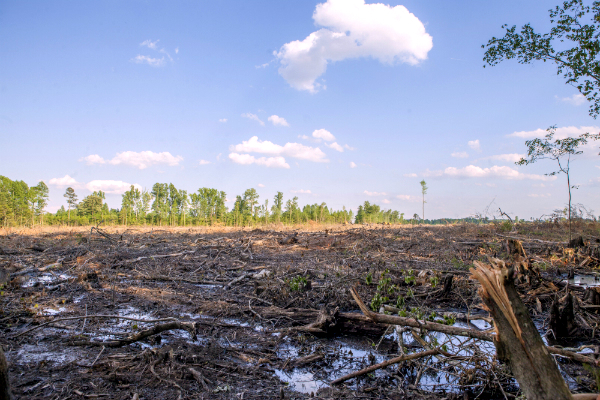 The US South is already one of the major global hotspots for forest degradation. The Southern US contains about 2% of the world’s forests but produces about 25% of the world’s timber products. At the same time our native Southern forests are some of the most ecologically important and biodiverse in the world. The last thing our forests and communities need is another industry that has been proven to increase rates of logging and conversion of our natural forests to pine plantations. The wood pellet industry attempts to delude decision-makers and the general public that the logging and burning of trees will benefit our climate and our forests based on a complex economic forecasting that conveniently models an industry fantasy and not reality. A fantasy where despite more logged forests and conversion of natural forests to monoculture pine plantations, there are actually more “forests”. As we know all too well here in the South, industry funded studies come out with industry desired results – just ask the coal companies. We don’t need a complicated timber model to predict what will happen to Southern forests if the wood pellet export market continues to grow. We know exactly what happens to forests when markets expand. They disappear all around us. We have plenty of historical data documenting the rate and scale of forest cover loss and associated degradation of ecosystems when markets for wood expand. Increased logging and the conversion of natural forests to plantations across the South over the span of many decades have combined to create a fragmented landscape of clearcut forests and single species, intensively managed pine plantations. The wood pellet market will most certainly get us more of the same. Yet, pellet manufacturers continue to claim that they “..do not and will not contribute to deforestation.” and due to these false claims it’s critical that we generate evidence of the wood pellet industry is really doing to native forests in the South. Recently a couple of us here at Dogwood went out on an investigation of the wood pellet manufacturing facilities in North Carolina. All of the facilities are owned and operated by Enviva and exist for the sole purpose of producing wood pellets to feed the market in Europe, particularly the UK-based utility company Drax. We travelled six hours from our home base in Asheville, NC to the coastal plains of northeastern North Carolina and southwestern Virginia – ground zero for the US wood pellet industry. The three Enviva wood pellet facilities located in this area (Ahoskie, NC, Garysburg, NC and Southampton, VA) are clustered together in overlapping sourcing areas that leave little chance for native wetland and bottomland forests to stay off the chopping block or avoid being impacted. As someone whose work is dedicated to protecting Southern forests, arriving at the Enviva facility in Ahoskie is a terrifying experience. First, it’s located practically in the middle of town with restaurants, homes, shopping centers all in close proximity. The facility’s smokestack emits an enormous, white cloud, and in our approach, we could practically feel ourselves breathing in the wood dust. 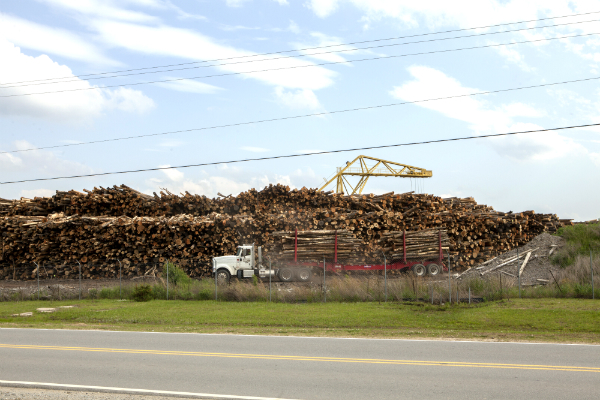 Log piles of hardwood trees stacked 30-40 feet high and hundreds of yards long loom above as logging trucks loaded with trees entered the facility every few minutes. We saw more trucks loaded with pellets leaving, on their long journey to be burned in foreign power stations. My first incredulous thought on this day was: This is “green” energy? 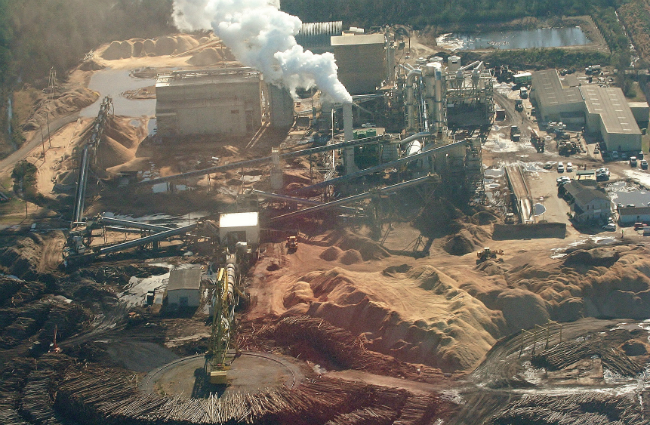 Overhead picture of the Enviva Ahoskie pellet manufacturing facility. To keep our evidence as irrefutable as possible, we must identify a specific truck. 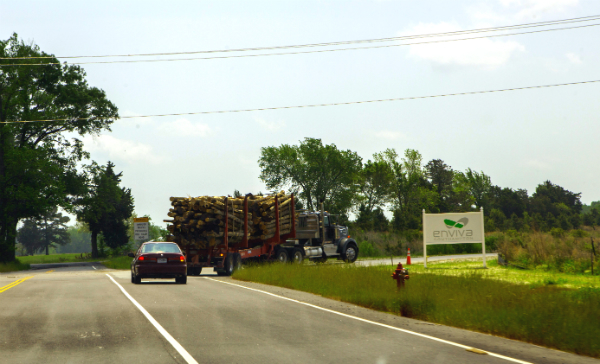 Logging truck loaded with trees drives inside the Enviva Ahoskie facility. Trucks just like these enter the pellet facility at estimated rates of 10-25 trucks per hour. We visually mark the truck as it enters the facility loaded with hardwoods; we record the license plate and registration numbers listed on the truck, and then we follow it when it exits to pick up another load. Pellet facilities can have a sourcing radius of up to 75 miles, and we often run the risk of a truck leading us nowhere. But on this hot day in May, we lucked out and tracked the empty logging truck from the facility in Ahoskie, NC to a forested area about 20 miles away. From where the truck entered the site, it was impossible for us to follow. For obvious reasons, a team of forest activists with cameras are not the most welcome crew at a clear-cut. Before we would attempt to document what we assumed was a clearcut, we had to first ensure that trees from with site were being sourced for pellets. It took almost an hour for our marked truck to exit, and during that time, several trucks continued to enter and exit the site. When our truck did exit the site, we followed it directly back to the Enviva facility. Now we knew for certain that this site was sourcing for pellets. It was time to see exactly what the cut looked like and where it was located. After following trucks from the logging site we trace them directly back to the Enviva facility. Making certain that the site is being sourced for pellets. Getting to this clearcut was extremely difficult. Entering from the front was far too visible, and any access points from the sides would be too far of a trek. Our only option was to trek in from the back, which required going directly through the Urahaw swamp. 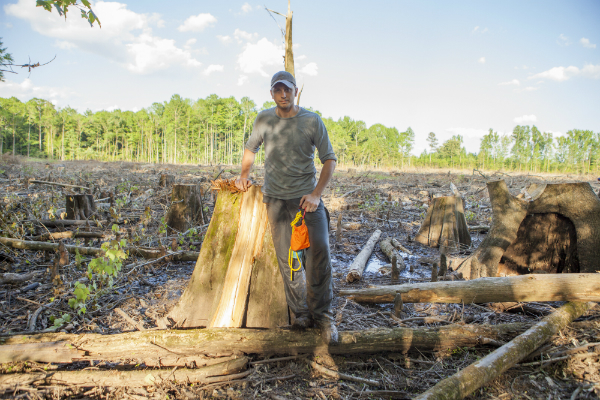 After organizing our gear, we headed in, guided by the destructive sounds of logging equipment in the distance. We trudged through mud and water up to our knees. Wildlife buzzed, chirped and splashed all around as huge Cypress trees towered above. 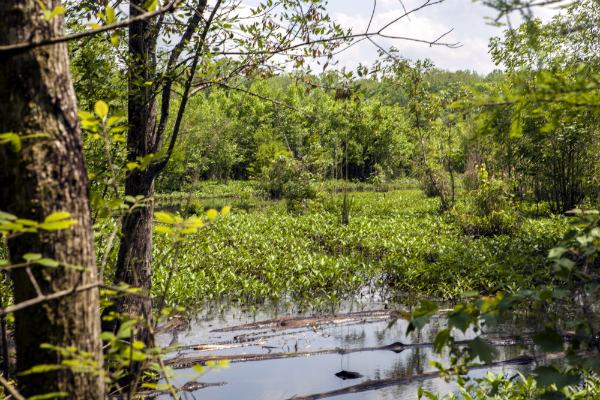 This majestic swamp serves as a true testament to the incredible biodiversity that exists in this region. Then we hit a thicket – an almost impassible tangle of thorns, shrubs and invasive species. This morass was nothing like the incredible forest that we’d just passed through. There’s only one way that such a drastic change in the landscape could have taken place. This was the site of an old clearcut. It had been cut and left to regrow years ago and was now filled with invasive tree species such as privet and tree of heaven. The ground was almost dry, a stark difference from the freshwater aquatic ecosystem that we had just waded through. Many decades from now (or maybe never) this old clearcut might return to being a true forest, but will never be the same as it once was. This was an important reminder that when we destroy forests, they’re gone forever. Yes, new trees and plants will grow, but you can never replace a native forest. We must protect the native forests we have left. After walking through a beautiful wetland forest we entered an old clear-cut now turned into an exotic-invasive thicket seen above in the distance. Walking through the thicket made the going much slower, but sounds of trees falling were getting closer; that was all the motivation we needed to keep moving forward. After another 20-30 minutes we arrived at the edge of Potecasi Creek, which was a welcome relief compared to the nearly impassible thicket. But our joy was short lived as we approached the creek’s edge and saw what lay on the other side. The knees of Cypress trees are iconic to the species, essentially the tree’s roots that emerge from the ground. Although scientists are still unclear as to their actual use, I like to think of them as the tree’s communication network – beacons that communicate with other Cypress in their wetland home. When we looked across Potecasi Creek, all that was left were these knees and the stumps of once great Cypress trees. They had destroyed an irreplaceable wetland treasure. 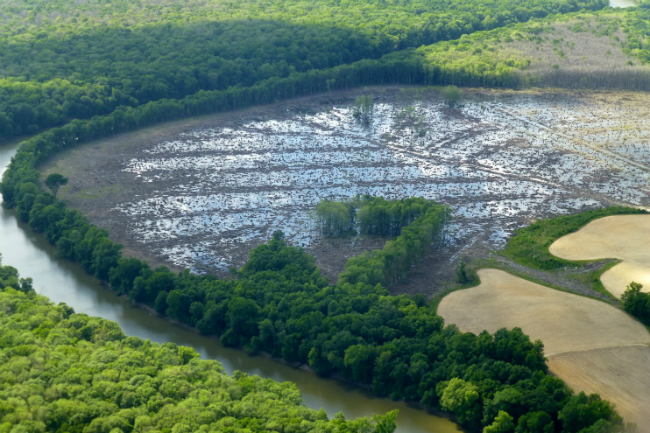 This native forests will never be the same again. Critical habitat is lost forever. What happens to the animals who lose their homes? Though the effort we made was dangerous and the discovery was incredibly sad, documenting the true story of the impacts of European demand for wood pellets is vital and will hopefully serve as a reminder of how the best intentions can often produce damaging results. This madness must stop. Biomass is not green energy. I hope European and American decision makers see our efforts and hear the call of all those individuals, organizations and companies from around the world for true energy solutions, not burning forests for electricity. I hope they correct the mistakes that were made before it is too late. Hear our message – this is a SOS. SAVE OUR SOUTHERN FORESTS! Wetland Forests in North Carolina and other parts of the Southern States of the USA. linked to Air Currents, Water Currents and overall the Oxygen that keeps all living animals alive!